I'm a flight attendant, and would like to create vector images of bombshell flight attendants for posters, and printing. 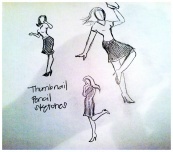 Sample picture are just thumbnail sketches of poses. I'll post a much improve sketches at a later date. I decided to choose this pose. I'll try to make my drawing better. Not sure if I'm happy with it.